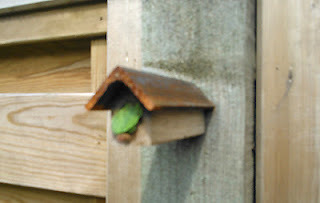 The Beesnees, Solitary Bee Houses really do work! Here's a hasty snap from a local back garden. Solitary bees love these little houses and they have been coming and going and filling them up. The image here shows how an industrious bee (a Mason bee or a Leafcutter) has blocked the hole. We're not experts but it could be storing pollen or there might be a little baby bee inside, waiting to hatch? We'll know in 30 days? Solitary bees don't produce honey or beeswax but they do pollinate so are great for the garden. What's more, these bees don't sting.